A past article in Get Rich Slowly discusses the The Balanced Money Formula. This is a budget idea presented by Elizabeth Warren and Amelia Tyagi in the book All Your Worth: The Ultimate Lifetime Money Plan. The basic concept for the Balanced Money Formula is that out of your net income (after taxes) you should aim to spend 50% on your 'needs', about 30% on 'wants' and save 20%. Needs are the things you can't go without and include: Housing, food, clothing, transportation, etc. Wants are the items that are luxury in nature and that you could cut back if you needed to. Wants include eating out, cable bill, movies, vacations and the like. Saving is any money you retain in an investment, put in the bank or put towards retirement. This may seem obvious but part of personal finances is sorting out the wants and the needs. Many people feel they "need" things that they really don't and should treat more things as luxury "wants". So by this measure I'm doing much better than goal. I'm saving a lot more of my net income than the goal. If I had a lower income then this might be considered in some eyes as a bit too miserly. You don't want to save so much that you end up skimping on necessities and end up having no fun at all. 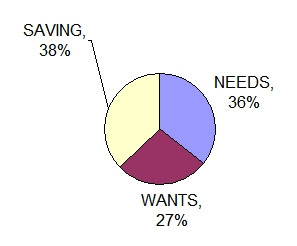 Generally though my saving % looks a lot higher cause I have a relatively high income level and I've minimized my spending on the 'needs' category. I don't have car payments and my home mortgage is only about 19% of my net income. We also minimize most of our bills and are fairly frugal about spending in general. In other words we're living well within our means. This is one of they fundamental keys to being successful financially. Our spending on 'wants' is fairly healthy. We spend nearly the 30% that the authors suggest. Thats a pretty large amount given my income. I personally think that spending some money on 'wants' is healthy. You don't want to be so frugal that you deny yourself any fun. Striking a balance between saving for the future and enjoying life in the present is important. I like the concept of the Balanced Money Formula. It allows you to track your finances with a budget mindset without going into so much low level detail as most budgets. I figure as long as you're saving 20% of your income or more then you're doing fine.